A blockage in the carotid arteries can cause cerebral ischemia, which results in damage to brain tissue. Cerebral ischemia is a condition in which a blockage in an artery restricts the delivery of oxygen-rich blood to the brain, resulting in damage to brain tissue. Cerebral ischemia is sometimes called brain ischemia or cerebrovascular ischemia. Cerebral ischemia can lead not only to brain-cell damage but to brain-cell death. A transient ischemic attack (TIA), also known as a mini-stroke, is when the cerebral ischemia causes the temporary loss of brain function. 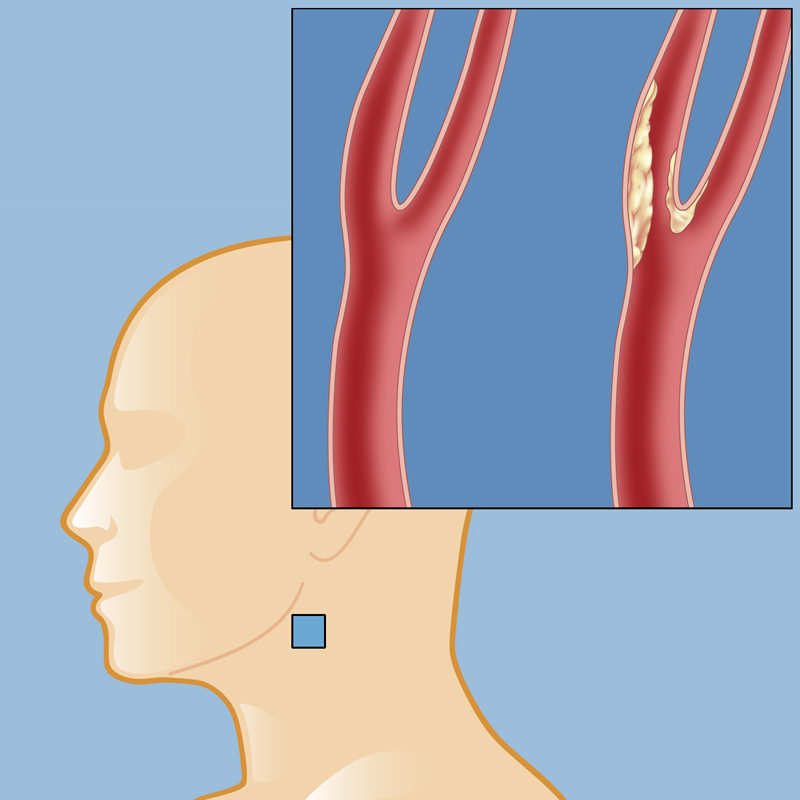 An ischemic stroke, also known as a cerebral infarction or brain attack, results when the loss of brain function is permanent and the brain tissue dies (sometimes called necrosis). Ischemic strokes are the most common form of stroke. Blood clots are often the source of the blockages that lead to cerebral ischemia. Normal function of the brain requires an adequate supply of oxygen-rich blood, which is delivered through two major sets of blood vessels known as the internal carotid arteries and the vertebrobasilar system (consisting of two vertebral arteries and the basilar artery). Atherosclerosis, the accumulation of plaque or fatty buildup in the arteries, can cause the passageways to narrow and become prone to obstructions that limit blood flow. The following risk factors are linked to atherosclerosis and cerebrovascular disease. Anything that causes compression of the blood vessels, including tumors, can lead to the restriction of oxygen to the brain. Cerebral ischemia can be caused by a heart attack as well. An untreated heart attack can slow blood flow until a clot forms, preventing blood from reaching the brain. People with congenital heart defects that affect the formation and connections of the arteries may be more likely to suffer from blood clots that lead to cerebral ischemia. Sickle-cell anemia is linked to cerebral ischemia because it affects hemoglobin, which is the oxygen-carrying part of red blood cells. In sickle-cell anemia, there is a shortage of red blood cells, and the ones that do exist are not flat but shaped like a sickle (crescent-shaped) and tend to clot more easily. Some severe infections, a ruptured blood vessel, or trauma that results in a large loss of blood can lead to low blood pressure (hypotension) and reduce blood flow to the brain. Decreased blood flow can be confined to just one particular region of the brain; this type of cerebral ischemia is called focal ischemia. It can be caused by a thrombosis, which is a blood clot in one of the cerebral arteries that restricts blood flow to one area. An embolism, which is a small piece of a clot that breaks off and travels -- eventually becoming stuck or severely limiting blood flow -- can also cause a focal ischemia. Global ischemia, on the other hand, describes the condition in which wide areas of the brain are being deprived of oxygen-rich blood. It can be caused by cardiac arrest (when the heart stops beating) or a heart attack (when blood flow to the heart is blocked).